One of the many, many subjects that this incredible episode of Person of Interest tackles is legacy; death is inevitable, especially for those who put their lives on the line on behalf of others, but it’s possible for the dead to live on in the database of the Machine. A standout episode like this suggests that the Person Of Interest staff is trying to ensure that the show they’ve dedicated so much of themselves to lives on after its upcoming finale. “The Day The World Went Away” is the kind of episode that will inspire viewers to recommend the series to their friends. The show will live on in a Machine of its own—a machine known as Netflix Instant (at least until CBS allows its contract to expire). The writing of this episode is top-notch; both the plotting and the dialogue are operating on an expert level. Delivering these particular lines and moments requires incredible skill and the actors rose to the challenge, unsurprisingly. 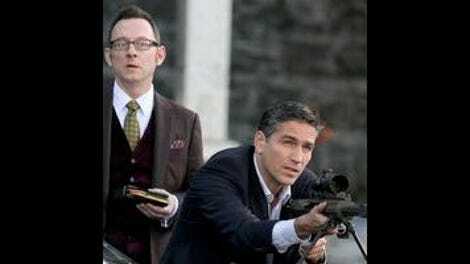 Some of the best episodes of the series are those that show off Person Of Interest’s range, balancing rich, philosophical dialogue with complex, thrilling action sequences. This is one of those episodes, and it’s a great way to gear viewers up for the final showdown. There is so much foreshadowing in this episode, which makes the viewing experience especially rewarding and makes sense given the installment’s interest in subjects like time and fate. Past, present, and future intersect in a devastating episode that changes everything for the team, and possibly the world. Team members’ past lives reemerge throughout. Finch blows his cover because he can’t help himself from revisiting the café where he dined with Grace ten years ago. Continuing to try to forge a new future for himself, Elias assumes the role of protector when the latest number turns out to be Finch. Samaritan agents are in hot pursuit, and this pairing reunites after working together in the last episode. They revisit the origins of their relationship by hiding out in the very building where Team Machine initially met Elias. These reminders of the past also reinforce the bittersweet fact that Team Machine abandoned normal lives for this cause; their lives would never be the same after they joined these ranks, for good and for ill. The future also becomes a subject of conversation; both Finch and Elias have predicted they’d end up in jail when they try to predict their fates. These two very different characters now work together. They operate above the law, but it’s for a good cause. They can’t calculate the future with the Machine’s accuracy, but the team members have made the decision to risk their lives in order to protect others, so they all have to grapple with the uncertainty that this choice brings. Elias did not plan on being gunned down by a Samaritan officer, but it was the risk he was willing to take. Finch is brought to Greer, who insists that the intention was never to kill the creator of the Machine. Instead, his skills are needed and he will inevitably switch sides of his own volition. In contrast, Root is a character who turned over a new, more positive leaf thanks to Finch and his Machine. 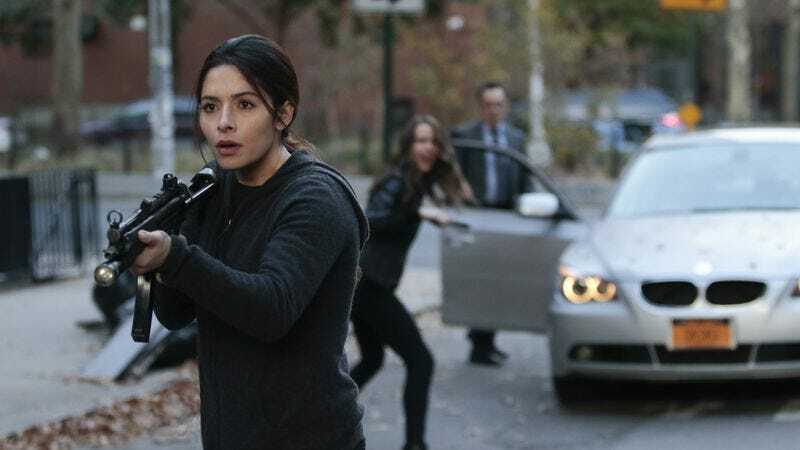 Root and Shaw work together to rescue Finch from Greer and fight off the Samaritan forces. Root reflects on the choice she made when she joined Team Machine, and insists that she doesn’t regret this decision. This cause set her on a more positive path and she found the love and family she had been missing her entire life. Root also acts as Finch’s protector as Samaritan bears down on him, but there’s only so much she can do. In a cruel twist of fate, a man who escaped a life of crime then found himself on an even worse path winds up being the Samaritan agent who injures Root. In this episode, both Elias and Root end up sacrificing their lives in order to save the man who saved them first. This outcome is especially cruel since it’s one that Finch has been trying to avoid. He himself has been preparing to sacrifice himself for the good of the team if there were a showdown, but again, he’s only human and he was powerless to prevent these tragedies. Finch’s preoccupation with his seemingly inevitable death at the beginning of the episode foreshadows these events, but also distracts from the identity of the real victims. Finch may escape from the clutches of Samaritan thanks to his protectors, but he doesn’t avoid capture altogether. Landing in police custody is preferable to succumbing to Samaritan forces, so he jumps from the frying pan into the fire. Thus begins a fantastic character turnaround that the series has been heading towards from its inception. Especially in comparison to Reese, Finch has always been portrayed as the weaker, meeker member of Team Machine. His big heart is often his worst enemy. Nonetheless, his experiences fighting for a cause and Root’s consistent efforts of persuasion have prepared him for what he needs to do to win this war that he indirectly started the day he created the Machine. As predicted, Finch has wound up in jail; the victim has become the perpetrator. His suspicious, and possibly treasonous, past is held against him by an FBI agent. In a brilliantly written and acted monologue captured with intense close-up, Finch threatens both the agent and Samaritan at once. Finch refers to the corruption of the surveillance state, recalling the show’s original premise. At the same time, he declares that his days of following the rules—everybody’s rules—are over. War is declared. When the Machine calls, Finch makes one more potentially world-changing and life-ending decision—he answers. RIP Elias. You could only cheat death so many times. You were a criminal mastermind who worked his way into our hearts. His farewell scenes were very classy and respectful of such a great character. The indicators of how many people respected him and fought for him throughout his life, including his years as a criminal, were particularly powerful. The parallel shots of Finch being powerlessly ushered into cars after having to watch his fallen comrades perish on his behalf are heartbreaking. I would’ve quoted that whole monologue if I had the space. “I have played by the rules for so long.” “I wasn’t talking to you.” Chills. Chills everywhere. As the kids say, Emerson slayed. “Samaritan didn’t want him dead, at least not if they could capture him.” “Then why did his number come up?” “I think it was warning us what he might do to them.” This is gonna be good.